So Many Copycats.One True Leader. 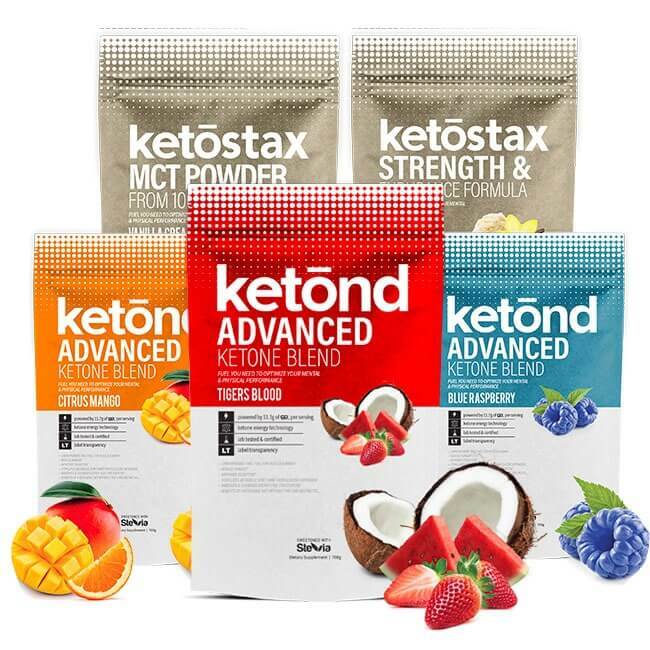 The Most Advanced Ketone Supplements Available! Your health goals are personal. Your Ketone Supplement should be too. BioMAX is a game changer. 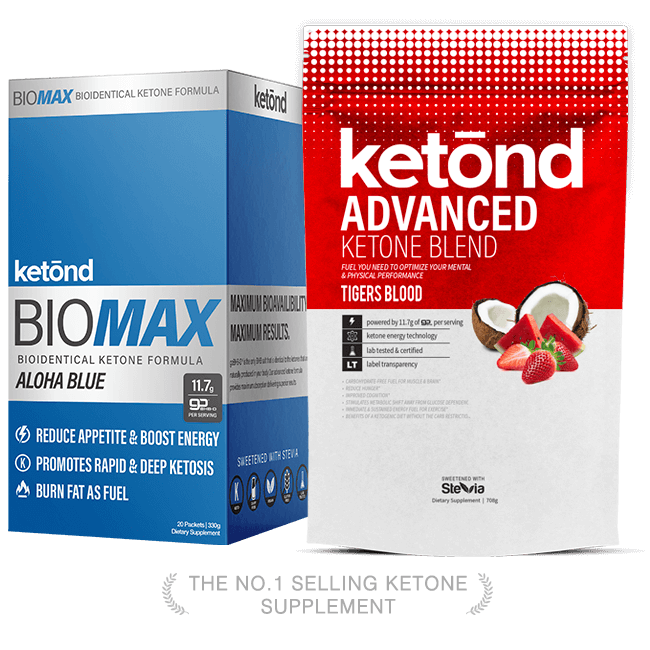 Ketond BioMAX is a biologically identical ketone supplement. It is ideal for everyone who wants a faster source of ketones to fuel your mind and body. We have added 4 powerful ingredients to this blend to help you lose more weight, improve athletic performance, suppress your appetite faster, improve insulin sensitivity and more. The ketone supplement that started it all. 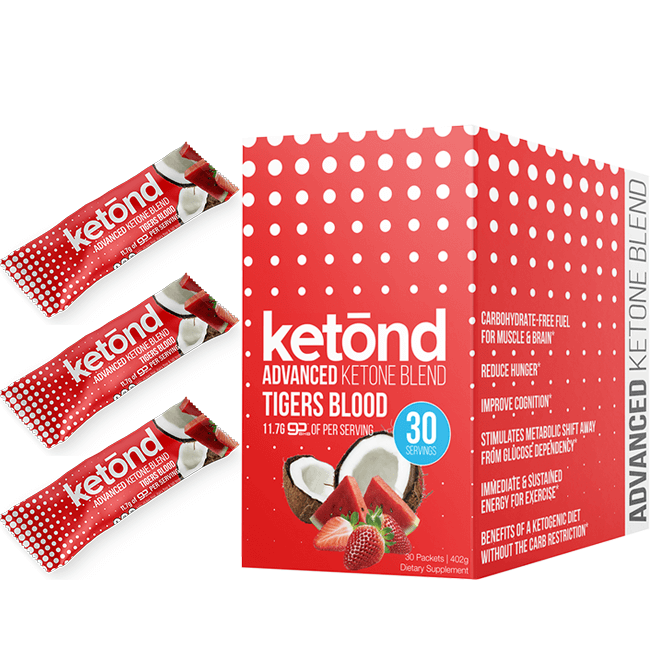 Ketond’s Advanced Blend is ideal for everyone who wants to benefit from a sustained increase in ketone levels. Some of the benefits include: accelerated fat loss, appetite suppression, enhanced cognitive function, improved workout performance, sustained energy, reduced inflammation, and more. Formulated with for proven results. 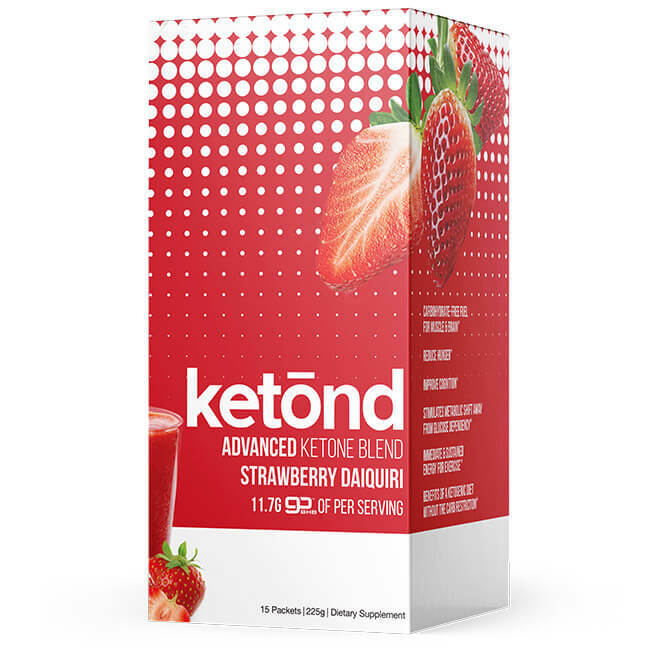 In 2016 Ketōnd was first to market with an Advanced and Affordable Ketone Blend. Each serving of our orignal blend contained and industry first 11.7g of goBHB. The bar was set. Maximum Dosage. No Proprietary Blends. 100% Ingredient Transparency. Because of our approach (and the best tasting ketone supplement around) Ketōnd became a HUGE success. In 2019 we are taking it to a new level and are proud to introduce Ketōnd BioMAX. Ketōnd BioMAX uses goBHB-D - the first of its kind all-natural ketone that is BIOLOGICALLY IDENTICAL to the ketones your body makes! 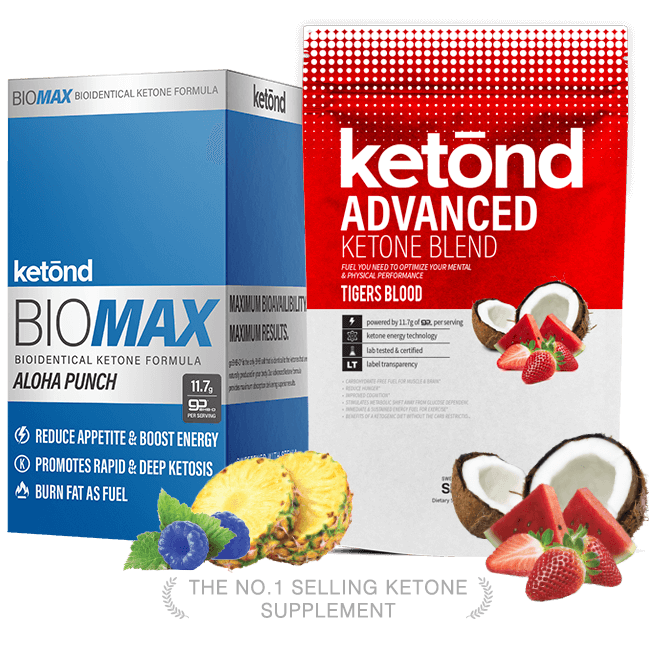 Not only is Ketōnd BioMAX the first to use goBHB-D BUT we have enhanced our blend with a unique blend of natural ingredients to further increase weight loss and appetite suppression. 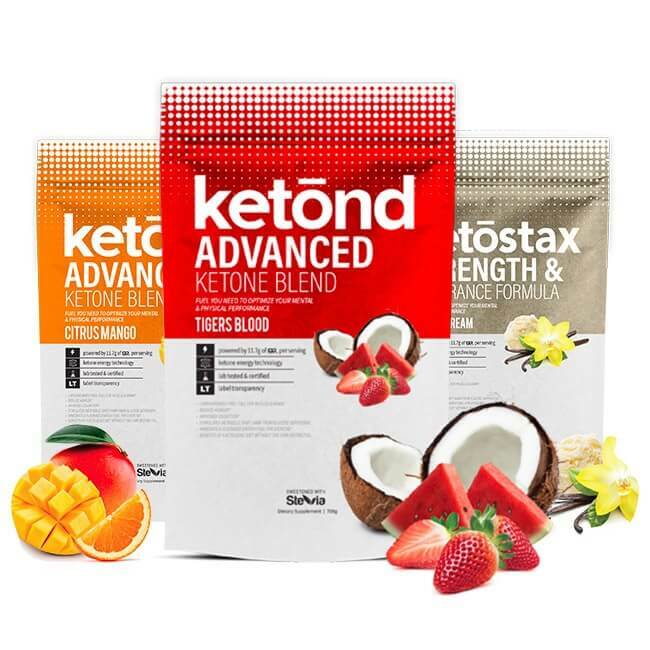 Ketōnd Advanced Blend, Ketōnd BioMAX and Ketōnd Meal Replacement all contain patented, proven ingredients to help you get into ketosis faster and enjoy the tremendous health benefits of taking ketones that researchers are just beginning to uncover. What consumers love the most about Ketōnd is that they are getting a premium supplement that contains patented and therapeutically dosed ingredients at a FRACTION OF THE PRICE. D-BHB is the naturally occurring, endogenously (“inside the body”) generated isomer produced through human metabolism of acetoacetate in the ketogenic process. Once D-BHB enters the blood, it does not reconvert to acetoacetate, and is metabolized rapidly making it a more readily available bioenergetic fuel source for body and brain. The majority of BHB salts on the market today are the racemic mixture, DL-BHB, which is comprised of a 50/50 mixture of D-BHB and L-BHB stereoisomers. Ketōnd BioMAX uses only the D-BHB isomer which is biologically identical to the ketone bodies your liver makes. Some of the many benefits of D-BHB are that it is more rapidly absorbed. 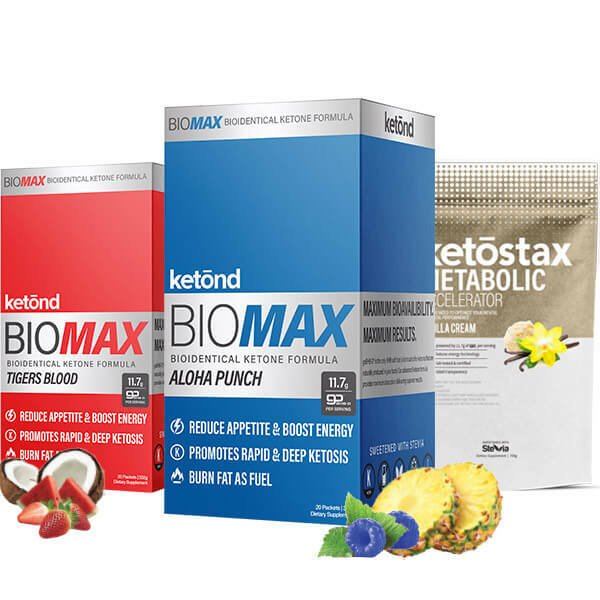 Ketōnd BioMAX appears faster in the blood than other keto supplements so it has the potential to provides more energy, better appetite control, and better performance. 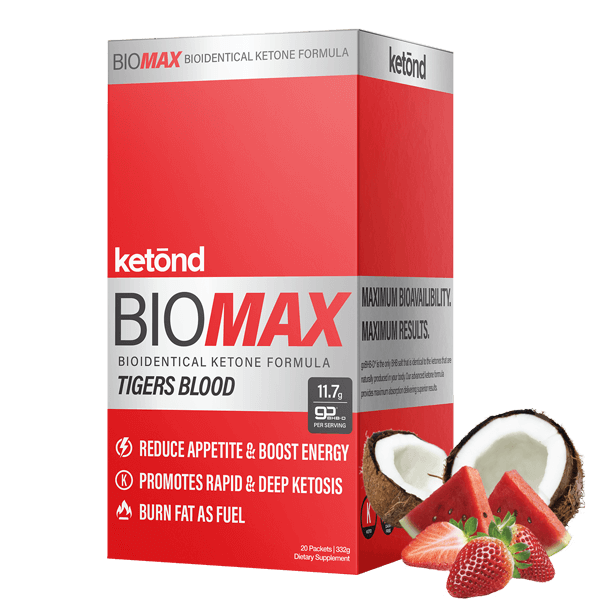 Ketōnd BioMAX, powered by goBHB-D™ (D-beta-hydroxybutyrate), is the only ketone supplement that delivers the strongest dosage of this carbohydrate-free high performance fuel. Anyone looking to manage their weight, or feel more energetic throughout their day will love Ketōnd. 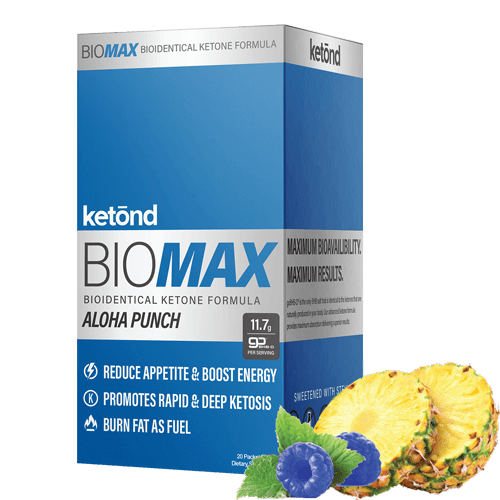 Ketōnd BioMAX is the perfect supplement that is proven to help you lose weight, maximize cognition, and simply help you feel more energetic. It’s perfect for busy professionals, athletes, or even on-the-go moms and dads who want to look, feel, and perform at their best. † *Individual Results May Vary. Results will vary on individual circumstances. 11.7g 11.7g ? ? ? BHB Proprietary Blends & Under-Dosage: Ketones (BHB Salts) like goBHB™ are really expensive, and Bioidentical Ketones like goBHB-D™ are even more expensive. As you search for products that contain D-BHB, you will find that companies fail to disclose how much of this ingredient is being used in their product. They tend to mask or hide the amount in a “proprietary blend” or claim that there’s a “patent-pending”. If there truly was a patent, the ingredients would be listed in the patent application. So, it is a huge red flag to all consumers when a supplement company doesn’t disclose the quantity of ingredients that are in their product. When you are buying a D-BHB or Ketone Supplement, the only thing you are really paying for is the D-BHB. It usually accounts for over 90% of the cost to manufacture a supplement. Understanding the amount of BHB and how much you're paying per serving is the best way to assess the most efficient cost breakdown. 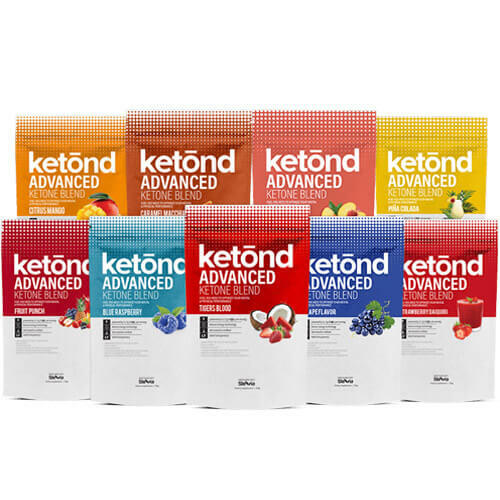 As the chart shows - Ketond Products across the board are around less than 50% the price per serving than the competition. 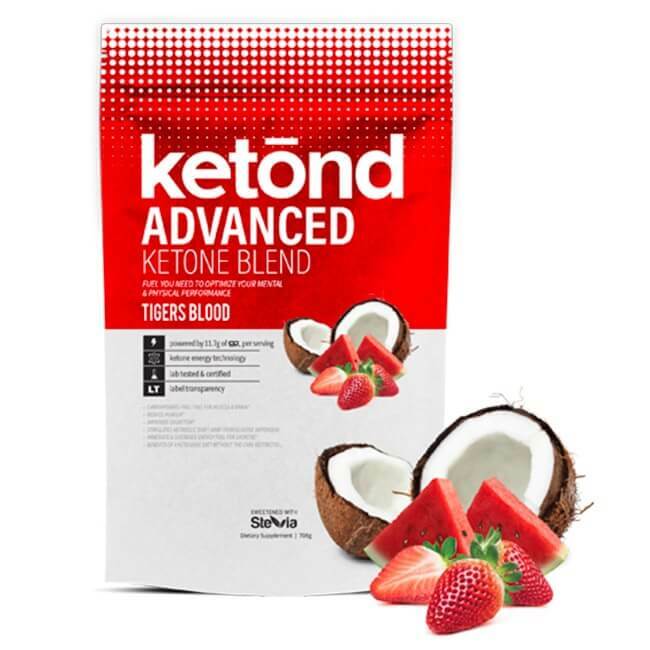 “Ketōnd does what all the other keto supplements wishes they could. 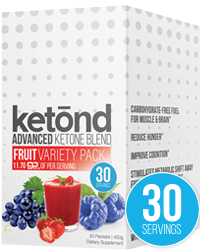 We deliver unique & powerful Ketone Blends whose ingredients aren’t hidden behind some “Proprietary Blend” effectively hiding the true dosage of BHB/Ketones. Our label is 100% Transparent. We list what is in our product and the exact amounts of what’s in there. What you see is what you get. Ketōnd is Hands Down the Superior Ketone Supplement On the Market. More importantly Ketōnd is NOT part of some multi-level, direct pyramid style of marketing program. This means we are able to offer our product at a FRACTION of the cost of the other guys. Go ahead and research for yourself. Multilevel companies are great for the guys in the Pyramid but not so great if you are looking for a great supplement sold at a great price. GET UP TO 2 KETŌSTAX OF YOUR CHOICE FREE! For a limited time, when you purchase 2 or more bags of Ketōnd, you’ll receive 1 or more bags of your choice of Ketōstax. Ketōstax + Ketōnd contain the perfect blend of what you need to achieve your fitness & performance goals. Ketōstax retails for $55.95. Supplies Are Limted So Take Advantage of this AMAZING Offer and Get KetoStax FREE Today! If you are looking for an added boost of KETONES, to INCREASE STRENGTH AND ENDURANCE, or the ULTIMATE METABOLIC ACCELERATOR, simply mix one or all of our Ketōstax to your glass of Ketōnd. Take Your Results to the Next Level with Ketōnd and KetōStax. *Individual Results May Vary. Results will vary on individual circumstances. One serving of KetōStax MCT Powder contains 5.8g of GoMCT™. We chose to use GoMCT™ as our source for MCT because of its ability to efficiently optimize ketone production. It also contains acacia fiber, a prebiotic that aids in gut health. Together, MCT and acacia fiber optimize the gut-brain axis. Simply stir in this powder with any of the delicious Ketōnd flavors and you have an instant source of one of the cleanest fuel sources available for your body. One serving of KetōStax MCT Powder powered by GoMCT™ contains almost 6g of this amazing energy source. Like all the products in the Ketōnd lineup, KetōStax Metabolic Accelerator doesn’t cut any corners. That’s because 8 scientifically proven fat-burning ingredients AND just like the rest of our products every ingredient is listed on the supplement facts panel along with its actual dose. If you’re ready to take it to the next level and work on dropping some serious body fat then all you have to do is mix one serving of Metabolic Accelerator with Ketōnd and you have the ultimate fat loss supplement available. There are no fillers or token amounts of ingredients sprinkled in this formula to increase the cost or let us bolster marketing claims like so many other supplement companies do. By combining 4 the best strength and endurance ingredients into one formula KetōStax can help you push your limits so that you can optimize your performance and reach your potential. Our blend is perfect for busy professionals, athletes, or even on-the-go moms and dads who want to look, feel, and perform their best. 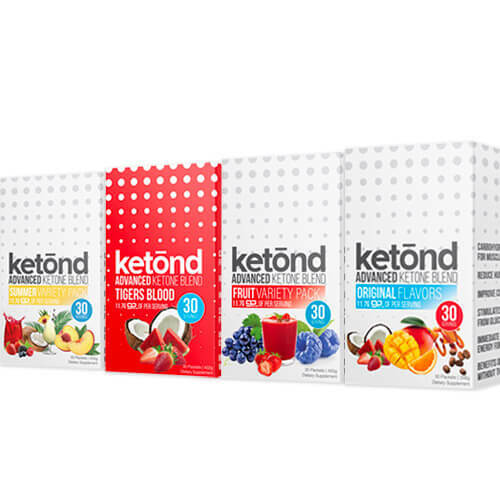 Ketond is committed to give you optimal health benefits while undergoing a low-carb / keto diet by helping replenishing missing electrolytes, balancing blood sugar levels, restoring energy and re-hydrating. If for any reason you are dissatisfied with the product, simply return all the unused products you ordered within 30 days, for a full refund (​excluding shipping), no questions asked! *Other Ingredients vary by flavor. Sweetened with stevia. 2. 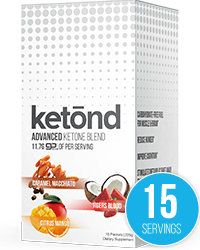 Mix 1 packet of Ketōnd in 12-16 oz. of cold water and shake or stir then drink. 3. If weight loss is your goal, our customers have had accelerated results by adding a scoop of Ketostax Metabolic Accelerator. 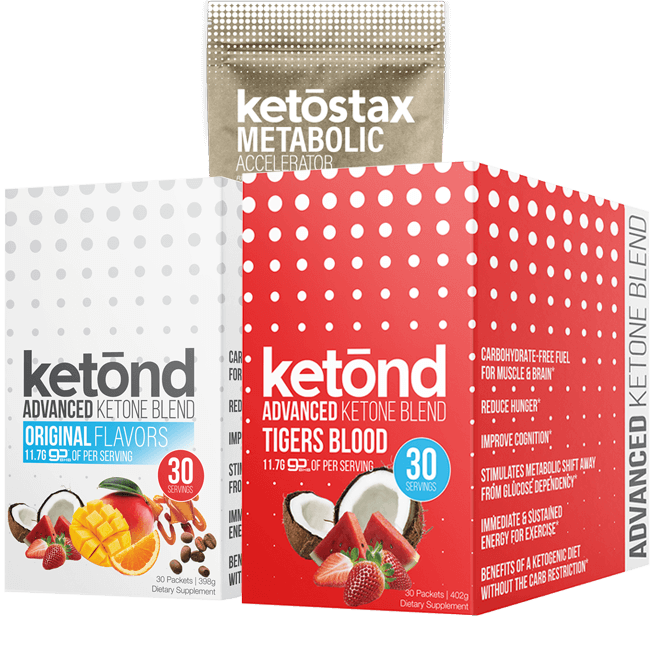 For a limited time you can get the KetoStax Metabolic Accelerator for free when you buy 2 or more Advanced Ketone Blends (See Below). 30 minutes prior to training, mix one stick of Ketōnd BioMAX with 12-16oz of water, almond milk or whatever you like. You will notice improved endurance, strength, fat loss, energy, and so much more! 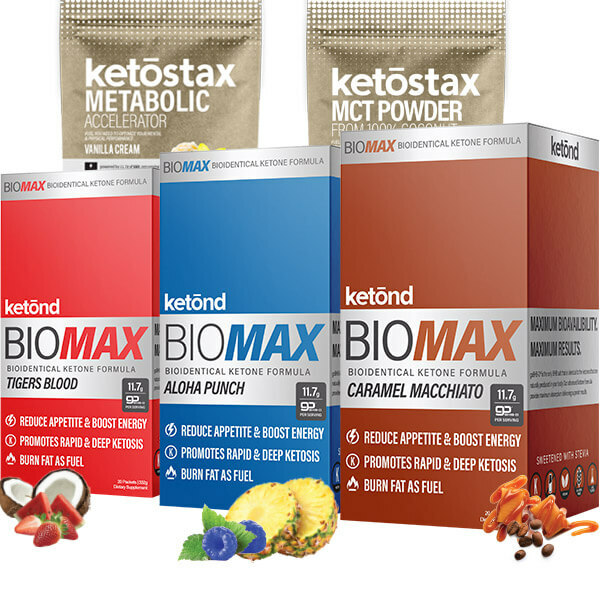 BUY KETŌND BIOMAX DIRECT & SAVE! 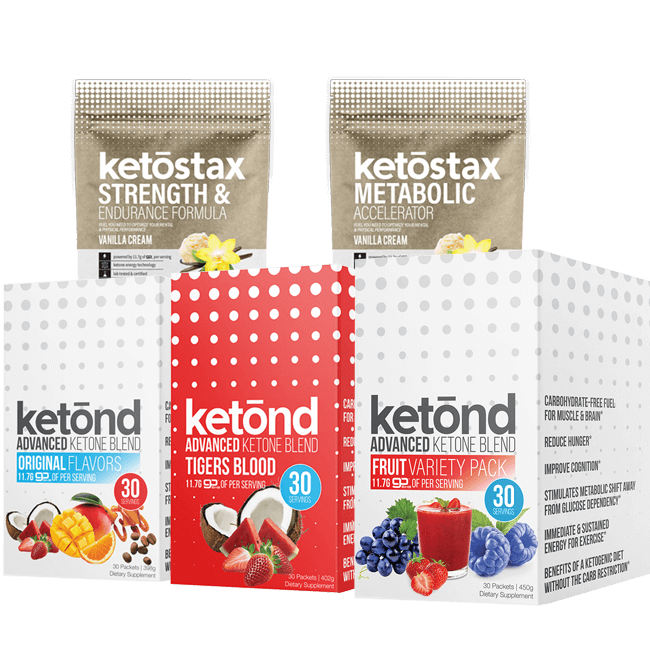 Don't Forget the FREE Ketostax when buying 2 or more Ketond! 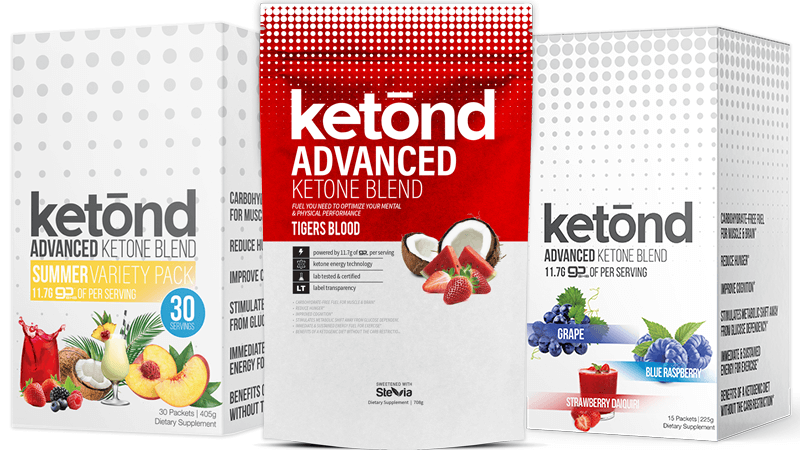 Ketōnd has become the consumer’s choice for keto supplements. Ketōnd comes in 9 delicious flavors and is available in the original 30 serving bag and our NEW "On the Go" stick packs - so now you can take Ketond with you wherever you go! Besides our delicious flavors, what consumers love the most about Ketōnd is that they are getting 30 patented and therapeutically dosed servings for HALF THE PRICE. Unlike the competition Ketōnd is always 100% transparent with all of the ingredients used and nothing is hidden in a “Proprietary Blend”. If you are looking for an amazing ketone supplement at an unbeatable price then you’ve come to the right place! In recent years the Office of Naval Research (ONR), Department of Defense (DoD), private organizations and foundations have been researching the amazing effects of ketone supplementation on human health and performance. 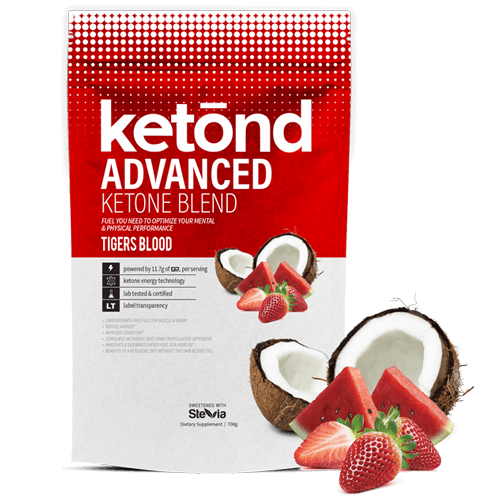 Ketōnd powered by goBHB™ (beta-hydroxybutyrate) delivers the purest dosage of this carbohydrate-free high performance fuel. Anyone looking to manage their weight, or feel more energetic throughout their day will love Ketōnd. 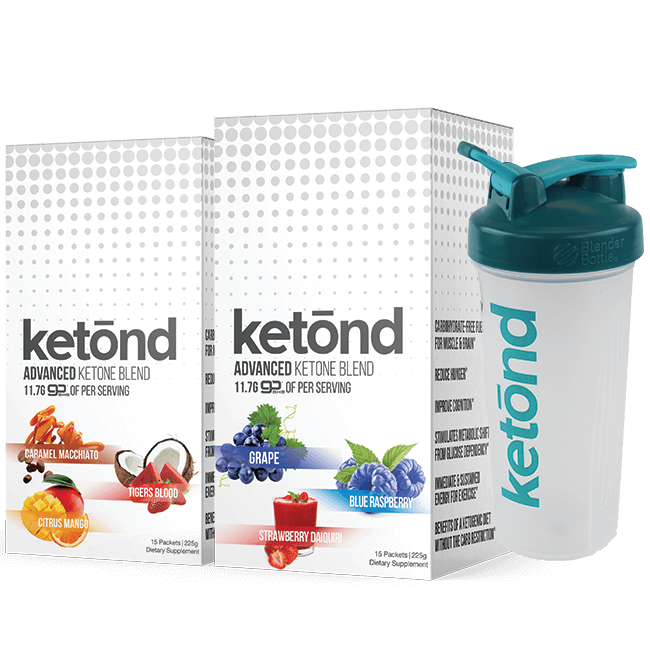 Ketōnd is for anyone looking to manage their weight, maximize cognition, or simply feel more energetic in a low carbohydrate environment. It’s perfect for busy professionals, trainers, or even on-the-go moms and dads who want to look and feel their best. † *Individual Results May Vary. Results will vary on individual circumstances. “Ketōnd does what all the other keto supplements wishes they could. 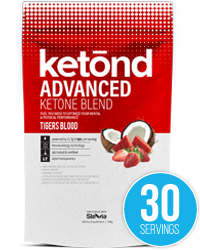 We deliver an Advanced Ketone Blend whose ingredients aren’t hidden behind some “Proprietary Blend” effectively hiding the true dosage of BHB/Ketones. Our label is 100% Transparent. We list what is in our product and the exact amounts of what’s in there. What you see is what you get. Simply stir in this powder with any of the delicious Ketōnd flavors and you have an instant source of one of the cleanest fuel sources available for your body. If you’re ready to take it to the next level and work on dropping some serious body fat then all you have to do is mix one serving of Metabolic Accelerator with Ketōnd and you have the ultimate fat loss supplement available. By combining 4 the best strength and endurance ingredients into one formula KetōStax can help you push your limits so that you can optimize your performance and reach your potential. 3. 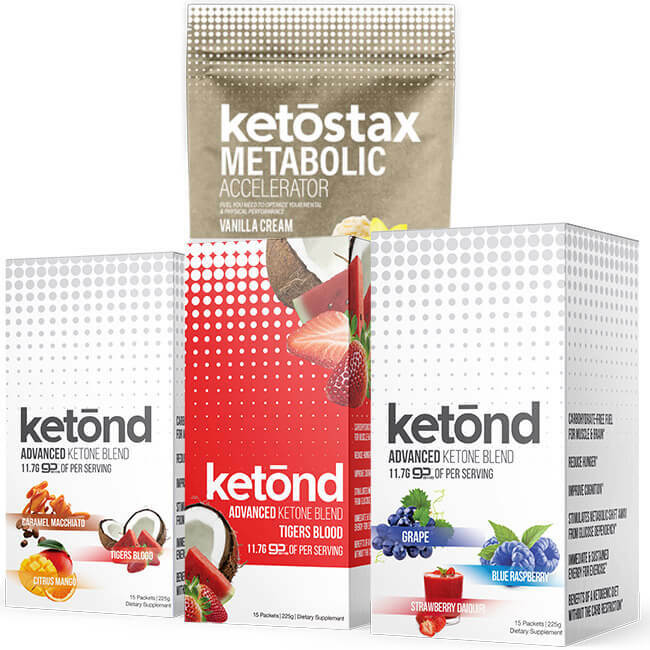 If weight loss is your goal, our customers have had accelerated results by adding a scoop of Ketostax Metabolic Accelerator to Ketond's Advanced Ketone Blend. For a limited time you can get the KetoStax Metabolic Accelerator for free when you buy 2 or more Advanced Ketone Blends (See Below). 30 minutes prior to training, mix one scoop of Ketōnd with 12-16oz of water, almond milk or whatever you like. You will notice improved endurance, strength, fat loss, energy, and so much more! How Much Would You Have to Spend on the "Competition" to Get What's In ONE Bag of Ketōnd? 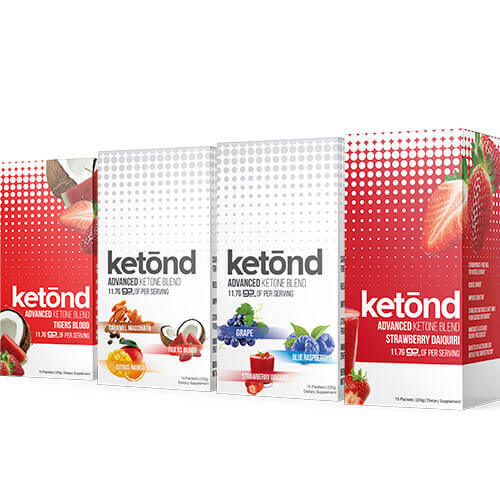 Ketond is committed to give you optimal health benefits while undergoing a low-carb / keto diet by replenishing missing electrolytes, balancing blood sugar levels, restoring energy and re-hydrating. If for any reason you are dissatisfied with the product, simply return all the unused products you ordered within 30 days, for a full refund (​excluding shipping), no questions asked! BUY KETŌND DIRECT & SAVE! Take 20% off for our 48 Hour Flash Sale! Save up to $45. While supplies last.